Currently, the LEGE collection maintains over 380 strains of living cyanobacteria, which represent 46 genera spread across the phylogenetic diversity of these organisms. The strains were isolated mainly from saline and freshwater habitats in Portugal. An online-database can also be used to search for strains and associated data. Although primarily focused on cyanobacteria, in the near future the collection will harbor eukaryotic microalgae. Strains are characterized by means of genotypic and phenotypic-based approaches, in accordance with recent recommendations for identification. Currently, 80% of the LEGE strains have their 16S rRNA gene sequences deposited in GenBank. The ever-changing nature of taxonomy causes identification to change over time. 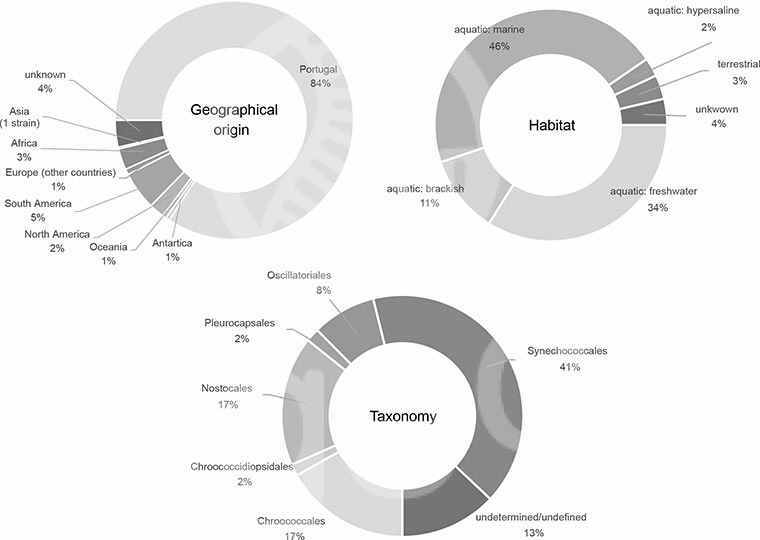 The current status of taxonomy of cyanobacteria and microalgae also renders difficult to keep the identification of strains present in a collection up-to-date. LEGE strains identifications are revised periodically and any taxonomic update for a strain will be added in the online-database. LEGE always revises the identification of deposited strains, which are usually identified by the depositor. Suggestions for the correction of names are welcomed. Cyanobacterial LEGE strains are normally kept at 10–30 μmol photons m−2 s−1 under 12h/12h or 14h/10h light/dark cycles. The range of controlled temperature conditions at LEGE are 14ºC, 19ºC (for most strains), and 25ºC. For specific culture conditions of a strain, please see the respective catalog sheet. Strains included in this catalog version are maintained by subculturing, in four different media (see p. 1). Subculturing transfers range from 2 (e.g. sensitive/delicate strains) to 6 months. Some strains are also cryopreserved at -80ºC. Soon, a stock comprising the full collection will be cryopreserved and stored at -150ºC. Any new entry in LEGE will be immediately cryopreserved. Strain replicates will be regularly thawed and evaluated for quality control, and the stock replenished. This long-term preservation procedure allows the genetic stability of LEGE strains and reduces the risk of strain contamination or loss. LEGE strains included in this first version of the catalog are unialgal/unicyanobacterial, clonal, and xenic (non-axenic). Axenicization of strains will be attempted in the future; still, the original xenic culture will be retained (in such cases, the strain code of both cultures will be slightly different – an “A” will be added to the axenic culture). Prior to any shipment, the morphological traits, growth and fitness of the strain are visually inspected. Cyanotoxin production by toxic strains are regularly evaluated by analytical chemistry methods, using CIIMAR facilities. Send us an expression of interest by using the contact form in the online-database or through our email. Full details and documentation for order confirmation, and instructions for payment will be sent at that time. For instance, before the supply of strain cultures from the LEGE collection, the customer shall complete and sign an Order Form and a Material Transfer Agreement. By ordering strains from LEGE, the customer agrees to not resell, borrow, transfer, or give our strains to third parties. For commercial use: 150€ (each strain). Since our prices can change, for a current value users are advised to consult the online-database or to contact us directly by email. For prices on other services, please see the list and/or contact us. Typically, for each strain ordered, LEGE supplies 2 x 5 ml tubes of culture in liquid medium. Shipping costs are borne by customers. For Europe, cultures will normally be shipped by regular postal service. For other regions, as a rule, it shall be by express or priority shipping services. Generally, shipping is performed 3-4 weeks after ordering and payment. Supply of strains at shorter notice cannot be guaranteed. We cannot guarantee the viability of strain cultures upon receipt. Yet, provided that LEGE is notified within 2 weeks of dispatch, if cultures arrive in an unsatisfactory condition we can replace them. In this case the customer will be charged only for shipping. Customers agree to cite properly the LEGE strain number(s) in all publications or patent applications and to acknowledge the LEGE collection as the source of the strains. Customers are kindly requested to inform us of any publication including LEGE strains. Tubes/cultures sent by LEGE should only be opened and used by trained persons, in suitable laboratory conditions. The volume and concentration of culture supplied is unlikely to be a serious hazard to laboratory workers, the community, livestock, or the environment. LEGE is not responsible to any damage or injury that might happen after arrival. The customer should maintain, grow, use or dispose the cultures in accordance with appropriate procedures and precautions to avoid risks to persons and to the environment. Some LEGE strains are known to produce common cyanotoxins. In such cases, customers will be warned about it. Specific hazards that may be encountered when processing toxic cyanobacteria and recommended control measures can be found in Stewart et al. (2009). Nevertheless, since other LEGE strains may produce other secondary metabolites with unknown toxicity, all strains should be treated with caution. In all situations, customers are advised to use a Class II biosafety cabinet for work with the cultures, and an autoclave or other suitable method (see Stewart et al., 2009) for disposal and decontamination within the lab. LEGE is open to deposition of strains, as long as the organisms adapt to growth conditions present in the collection. Candidate strains for deposition will be examined for contamination, proper identification and data accuracy. 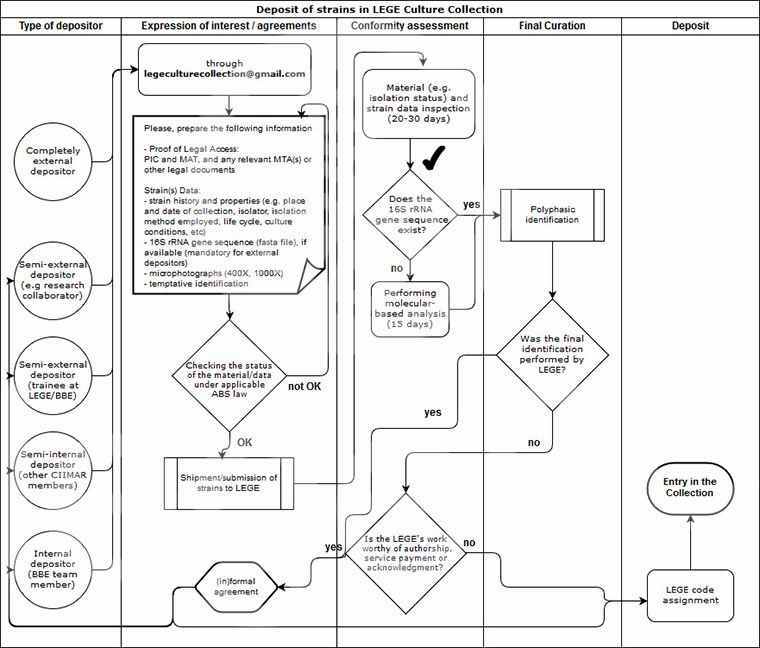 See the workflow scheme for a typical deposition of strains on LEGE. Deposit of strains in LEGE is free of charge. However, shipping and transport costs are borne by the depositor. Prior to the deposit process, depositor should review the status of the strains with regards to the Convention on Biological Diversity, the Nagoya Protocol or other related legal issues. All deposited strains are open to the public once their acceptance is approved. LEGE can offer long-term preservation of private strains (please see the price list).